Alaskan raw material on the other hand is closer to $4200 to $4400 per metric tonne. According to NOAA - Chum salmon was 18 percent of the 2018 Alaska statewide salmon harvest at 20.1 million fish, the 8th highest annual harvest since 1975. While supply was steady, many Chinese processors have limited raw materials because they received fewer orders for finished goods this season. 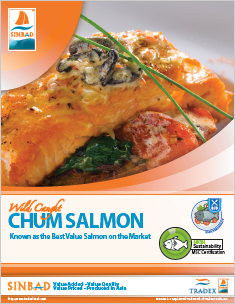 Many plants chose to focus on Pink salmon instead, as pricing is lower and supply is good. --- Domestically, headed and gutted 2-4lb Chums have dropped from around $2.25/lb in November to $2.05/lb this month. Many processors have reported high inventory volumes of headed and gutted Chums, driving pricing lower when Russian pricing has also dropped. --- We have seen the fillet market soften too. If we look at a 6-month review 1-3lb IVP Good meat colour fillets we can clearly see how the market has dropped. Back in July, pricing was around $4.75/lb. Fillets were steady during the Fall around $4.20/lb but recent offers show fillets more inline with the $4.10 mark. There is speculation that Chum salmon will be strong in Southeast Alaska next season, however NOAA has yet to release a formal Harvest Forecast for 2019. 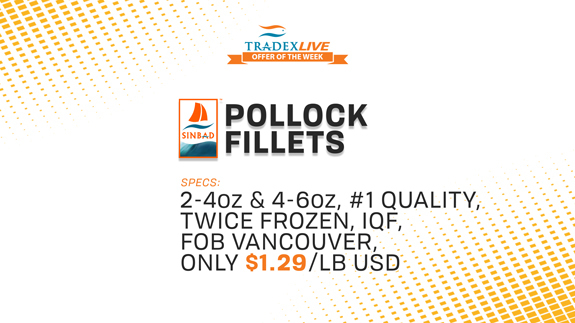 --- And Finally, our TradexLIVE offer of the week is for 2-4oz and 4-6oz SINBAD brand Pollock fillets. 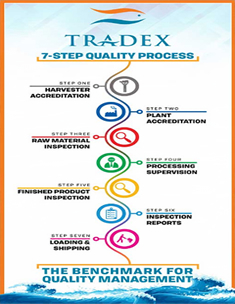 We have several pallets of #1 quality, twice frozen IQF Pollock fillets available in Vancouver for a sharp price of $1.29/lb USD.